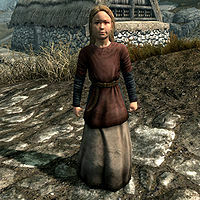 Sissel is a Nord child living in Rorikstead. She is the daughter of Lemkil and has a twin sister, Britte. Their mother died after giving birth to the twins and Lemkil now takes his frustrations out on his daughters, a fact that worries the small community to no end. Sissel wakes up every day at 6am and immediately exits the family house. Britte, however, will be quick to follow and Sissel then spends her entire day on the run from her bullying sister. This goes on for twelve solid hours, until Sissel finally gets a break at 6pm. She then heads over to her only friend, retired mage Jouane Manette in Rorik's Manor who secretly teaches her magic tricks so she can defend herself. At 8pm, with nothing better to do, Sissel reluctantly returns to the house, where she stays until her bedtime at midnight. Sissel wears a set of child's clothes with a pair of shoes. 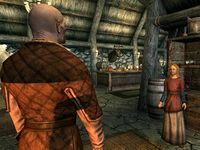 She carries a variety of food and toys, a belted tunic and the key to the house. 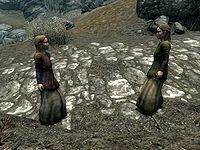 Even though her life in Rorikstead is hard, Sissel has hopes and dreams for the future, saying, "I wish I could be an adventurer like you, and go wherever I want." and "I had a dream that there was a good dragon. He was old and gray, but he wasn't scary." She also reveals how she is treated by her own family with "Most days, I do all I can to stay away from my sister and my father. The beating's the same from either one. ", nevertheless she sees the light at the end of the tunnel: "Some day soon I'll stop being afraid. Jouane is teaching me magic. He says I'm real good." "Oh! Are you going to teach me how to turn into a mud crab?" This page was last modified on 7 August 2018, at 22:45.